Chirps and Cheeps | Brown Booby - a Mega Rarity! Talk about being in the right place at the right time! It was an extraordinary day today. The day was exceptionally windy. How windy? It was so windy that if you opened your mouth, your cheeks would literally flap in the wind - windy! 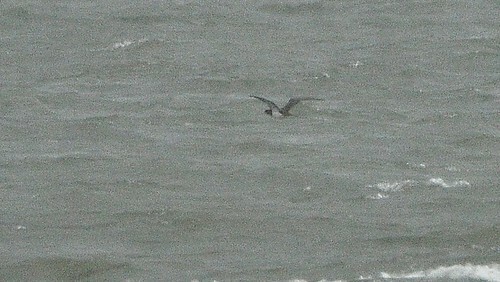 High winds mean jaegers and I've really been eager to see one! So, today, acting on Jim Pawlicki's advice that I should come down to the Erie Basin Marina to try for one - is how I happened to be birding with him when he spotted a mega rarity. As we were scanning the water for jaegers, gannets, or whatever the fierce winds and rains might blow in, Jim shouted he thought he found a Brown Booby. Struggling with the ID - having a hard time believing this bird would be flying over Lake Erie - he eventually realized his first instinct was right. 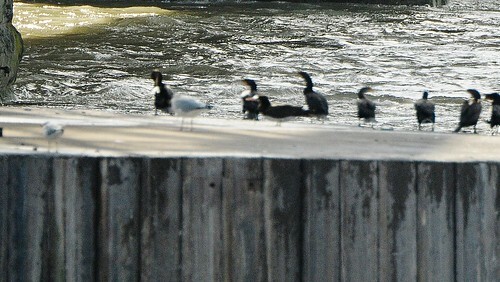 It was the very first sighting of a Brown Booby over ANY of the Great Lakes. Wow. TUESDAY MORNING UPDATE: Miraculously, the Brown Booby was still around this morning (Tuesday, 10/8/13). I met Celeste Morien down at the Erie Basin Marina at sunrise with hopes that she would get to see this wonderful rarity. As luck would have it, she DID! Mike Morgante relocated it and it gave us all a nice flyby too. I even caught a few photos this morning - MUCH BETTER than last night's! Several other birders showed up this morning as well and I was finally able to put some faces behind some very familiar names; it was wonderful meeting everyone! Also, on the way home, I had a flyover of a flock of 11 Canada Geese and 2 SNOW GEESE. A quick stop at Woodlawn Beach produced a Blue-Headed Vireo, a Black-throated Blue Warbler, a couple of Yellow-rumped, and 2 Golden-crowned Kinglets. Two SNOW GEESE mixed in with some Canadas - seen on my way home Tuesday! Super cool that you got to enjoy this rare bird siting. You were indeed in the right place at the right time. Congrats. Wow, the first sighting EVER on the Great Lakes?! What a rare and awesome opportunity. You did get some great pictures on Tuesday; thanks for sharing!